A powerful dark presence of an intense nature, connected with the local nature and with its spirit, ascending and descending, shaping through the clouds of the present. You can sometimes feel it is there, but you cannot grab it. Only your clean mind and soul can came close of its presence. From the very beginning we shaped ourselves into relating with it, so that is now part of us. That’s how we understand Negură Bunget. Negură Bunget is a black fog coming from a deep dark dense forest. The name tries to picture somehow the kind of atmosphere, both musical and spiritual we’d want to create through our music. It has also a symbolical nature, standing for the inexpressible parts of our ideology. The two words are also from the Tracic substrate of the Romanian language (the oldest one, containing about 90 words) as the interest for our local history and spirituality is something of crucial importance and meanings for us as a band. Immortally rising from the spirituality of immortal lands, Negură Bunget began their journey through the universe of Black Metal in early 1995, with Hupogrammos (guitars/vocals/keyboards) and Negru (drums). The duo’s first demo, From Transilvanian Forests, was recorded at Magic Sound Studio in Bucharest, November 1995, and released at the end of the same year, under the band’s original name, Wiccan Rede. The release of this demo was preceded by the band’s first live performance, in Buzau (June 1995) and was then followed by concerts all around Romania. Once their conceptual perspective shifted towards the exploration of the universe and spirituality of their ancestors, the band’s name changed to Negură Bunget. The new approach became clearly evident on the debut album, Zîrnindu-să, released by the newly founded Romanian label Bestial Records (late 1996). December 1998 brought Negură Bunget’s second release, Sala Molksa, a mini-album also released by Bestial Records. Sala molksa introduced the band’s third official member, Spurcatu, on guitars/bass. The 4 tracks unveil a much more straight-forward sound, complex, aggressive, atmospheric, fast – The Music of Transilvanian Spirituality. The band played in July 1999 at the Open Hell Festival in Volyne (Czech Republic). Măiastru sfetnic is the third opus of Negură Bunget. The album was released by Bestial Records in 1999 in a special digipak format (designed and handmade by Negură Bunget). More than 56 minutes, yet only 6 epic tracks, united in haunts, evilness, descent, atmospheres, speed and aggression… displaying the band’s vision on how a Black Metal-based world should have looked like. Măiastru sfetnic also brought the band a 3-album contract with Italian label code666 Records. A new track was recorded specially for code666’s compilation Better Undead Than Alive, and the band’s first video was shot for the same track (Văzduh) in the mountains of Transilvania. ‘N crugu bradului album, the first one to be released by code666 Records, can be seen as a spiritual endeavor though the essences of the Transilvanian traditional spirituality. Just 4 tracks, symbolizing the evolution of a year’s 4 seasons, yet 54 minutes of conceptual Black Metal. The album was released in February 2003, and got positive reviews all over the media, making the band better known on the international scene. In April/March 2004 Negură Bunget embarked on its first European tour, with gigs in Portugal, Germany, Belgium, Slovakia and Hungary. 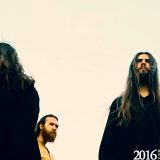 In the following summer the band also played at Under The Black Sun Festival in Germany and on Wanted Festival in Hungary. Finally, few gigs in Romania ended the year. 2005 saw the release of the limited edition Inarborat Kosmos MCD. With lyrics in English, the 4-track EP offers an apparently traditional Black Metal, but turned complex by intricate and slightly chaotic guitar sounds, which have by now become a landmark of the band’s constant quest for the proper rendition of Transilvanian Spirituality. The CD also contains a multimedia section with 2 live recordings. A second European Tour followed in October-November 2005, in anticipation of the following album, OM. 23 gigs all over Europe showed the band live potential is no less than its studio one. OM is finally released by code666 Records in November 2006 in a special double digipak edition featuring a CD and a full DVD. With OM Negură Bunget proposes once again a new complete opus, focused around the symbolism and signification of one unitary concept. Romanian language offers a vast and complex signification: OM means MAN (the human being), but OM is also the main contemplative state for elevation in traditional esotericism. A new extended European Tour took place in April/May 2007, with the band performing more than 40 concerts throughout the Europe. Another tour was done at the end of 2007, focused more on Netherlands and Germany. In October 2007 Negură Bunget signed a contract with German label Lupus Lounge / Prophecy Production followed by the release in 2008 of the early Negură Bunget albums on a special digipak edition. A live DVD was also recorded at the beginning of 2008 and is planned to be released by Prophecy Productions in early 2011. The begging of 2008 marked yet another European tour for Negură Bunget, this time along The Vision Bleak and Farsot. This was followed by a Romanian Tour in April. 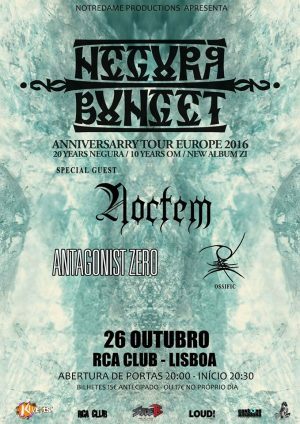 In the summer of 2008 Negură Bunget played some of the most important Metal Festivals: Wacken Open Air and Summerbreeze, and also Artmania Festival, Kaltenbach Open Air, Rockmania Festival, Paalisare Rock Fest. Another extended European Tour was completed in October/November 2008. The work on Măiestrit, a re-interpretation of the original Negură Bunget album Măiastru sfetnicwas finalized before the end of 2009, and the album was released in March 2010, by Prophecy Productions. 2010 was one the most intense year in the history of Negură Bunget. Two albums released, followed by a long European tour as headliners (Spirit of the Land Tour), another tour in autumn (Black Trolls Over Europe – 10 dates), some festivals in between (including Hellfest) and a lot of work, all make this year special and unforgettable. Figures for 2010: 72 gigs played, 2 European Tours as headliners, more than 50.000 km of driving by van, 66 answered interviews, more than 10.000 CD’s sold. 2011 marked 15 years of Negură Bunget, so the band activities celebrated this anniversary. April brought the release of the Live DVD – Focul Viuand of the MCD – Poartă de dincolosymbolically marking the end of the 10 years cooperation with Code666 Records. April also meant a tour along Norwegian legends Enslaved. Some summer festivals were played – Exitand Party San. The second part of 2011 saw the band on the Transilvanian Legacy Tour, traveling through Europe and Romania, playing more than 35 dates. In 2011 Negură Bungetstarted developing its most ambitious project, The Transilvanian Trilogy, a complex musical and visual trilogy. 2012 was another busy year for the band. March brought Negură Bungeton Paganfest Europein an amazing line-up along Eluveitie, Primordialand Solstafir. April/May was time for the very first US and Canadian tour – almost 40 dates were set for this amazing endeavor / Transilvanian Legacy. Some summer festivals followed. The first part of the visual / musical trilogy was developed and a complex production and recording process started. Some media recognition – the band was voted Best Romanian Metal band in 2012 by www.metalhead.ro, Romanian leading metal Portal and Metal Artist of 2012 by www.czb.ro. The 2013 started again intensely, with a complete reset of the band studio and live concept, meant to take the Negură Bunget on some brand new paths. A small tour in spring, some festivals in the summer, all prepared for an intense end of the year, with the band performing over 70 gigs in 3 months, throughout 3 different tours (including an extensive one with Greek legends Rotting Christ). TĂU, the first part of the Transilvanian Trilogy is finally seeing the light of day in 2014. Negură Bunget prepared an extensive promotion for it, including an European spring, followed by one in US and Canada in May and June. 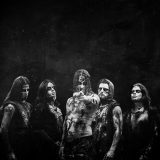 With more than 500 live appearances up to date, Negură Bungetis eager to unleash the power of their Black Metal, promoting its musical and spiritual vision and, as always… The Transilvanian Spirituality. In 2002 Noctem records its first demo â€œUnholy bloodâ€ which was commercialized for 2 years. After several line-up changes the band continues its way performing in national shows and composing new tracks, totally immersed in the seek of a more personal music style. The band commercializes their live mcd, entitled â€œLive 2004â€ (self- produced and recorded at their natal city) for two years. In 2007 itâ€™s time for the release of the last demo of the band, entitled â€œGod Among Slavesâ€. This opus received a good success from the online specialized press and metalheads. The band, composed by its new members, fulfills different tours through their country. In July 2008 the band signs with Noisehead Records (Austria) and carries out the â€œNoctem European Tour 08â€ where the band performs through different countries: Spain, Portugal, France, Andorra, UK, Belgium and Italy. In January of 2009 Noctem enters the studio to record their debut LP â€œDivinityâ€ at Vienna (At) which counts with the collaborations of Christos Antoniou (Septic flesh and Chaos star) and Leal (ex-Forever Slave). Noctem performs in different presentations of the album â€œDivinityâ€ being included in festivals and several tours, like the ones at Spain or Portugal in 2009, sharing stage with headliners such as Malevolent Creation (USA),Vomitory (Sweden) and Napalm Death. After a few shows at Spain, and the recording process of the third and most ambitious video extracted from â€œDivinityâ€, in May 2010 the band is included in the â€œCollectors of the King Tour â€œ, supporting Ragnarok(Norway) through Europe: Austria, Germany, Poland, Belgium and The Netherlands. In September 2010, the third video extractes from â€œDivinityâ€, entitled with the same name, was worldwide released; Including the collaboration of Christos Antoniou (Septic Flesh) in the orchestral arrangements and a team formed by more than 80 members. In march of 2011 the band announces their signing with the record label Rising Records for the European release of their new album: â€œOblivionâ€. The album was released in Spain in April 2011 and in Europe in June 2011 and licensed in USA through Metal Blade Records in October 2011. â€œOblivionâ€ received an outstanding feedback in Europe and North America. The â€œOblivion Spanish Tour 2011â€ started in the end of April and Noctem performed on the national stages during May, June, August and the end of September. In summer 2011 and after receiving a great response from the international specialized metal press and fans, Noctem announced their appearance in the â€œLux Mundi Europe Tourâ€²â€², where the band shared stage with international well known acts as Samael, Melechesh and Keep of Kalessin. Exilium was recorded in the summer of 2013 in theAGR Studios (Valencia) produced and mastered by Daniel Cardoso (Anathema). The album is be released by Art Gates Records in Europe in April 7th. In Summer 2014 Noctem inks deal with NorthAmerican label Prosthetic Records to release “Exilium” September 16th in Australia and The Americas!!! 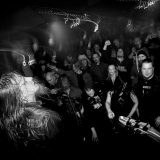 Antagonist Zero was formed 2010 in Porvoo, Finland. The band describes their music as Catatonic Metal, which is a mix of different types of metal genres, namely doom, death/black and post metal. Antagonist Zero consists of seasoned musicians from such local bands as Adastra, Cavus, Coprolith and Lost in Tears. They released their debut Nighttime Harmony March 2012. 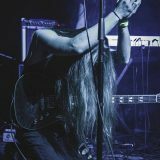 This melodic, atmospheric and slow-burning heavy three song EP has been embraced by listeners around the world and has received excellent reviews. This was only a taste of the band’s material, of which there was more than enough for a whole album. The debut full-lenght album “Doomed” was released 28.9.2012 through Violent Journey Records. The promoting of the album included live shows, festivals and tours across Europe, Baltics, Russia and China. Now the band is in studio recording their second full-lenght album which is set to be released early 2015.